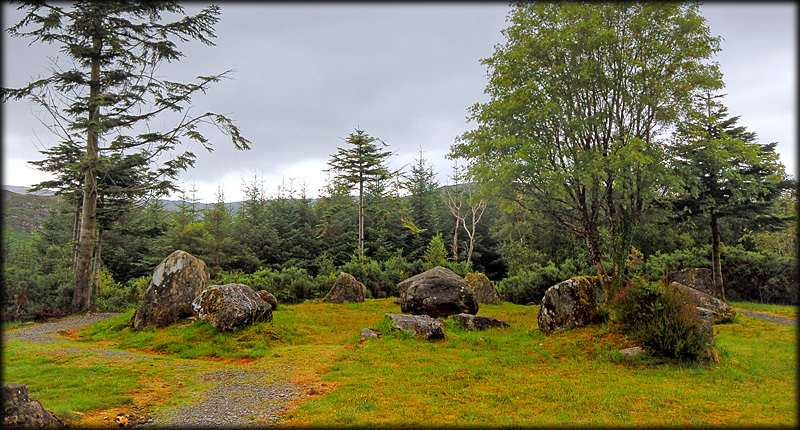 Not far from the ring fort is the second site on the Bonane Heritage Trail and the main purpose of our visit to Bonane-the stone circle. 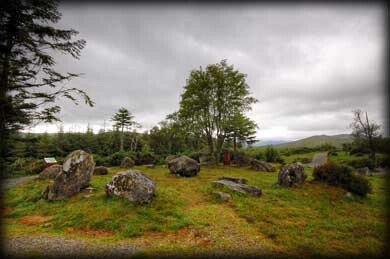 This is an axial circle consisting of thirteen stones, with a centrally located boulder burial. Known locally as the Judge and Jury, the circle is beautifully situated overlooking the Bonane Valley. One of the information boards at the site claims there are two sunrise related alignments and a lunar alignment from the circle to various points on the horizon. One of the entrance stones has fallen and the other standing at 1.4 metres in height is the tallest stone in the circle. The axial stone is the flat topped stone next to the tree in the image shown left. It stands at the SSW of the circle and is 0.8 metres high and about 1 metre wide. Only six or seven stones remain standing but this takes nothing away from a very fine circle. 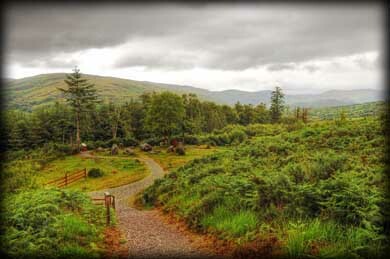 Sadly due to weather conditions our images do not do justice to the location. My only gripe about the Bonane Trail is the placement of the information boards. At all the sites they are by far too close to the monuments, the worst case being here at the stone circle. I would love to call back to here on a better day weather wise. Situated: Very easy, located on the Heritage Trail at Bonane Heritage Park. Discovery Map 85: V 9579 6537. Last visit July 2011.